It was just a coincidence that EMI Classics was readying this CD for release shortly before Mr. Corelli's death in November 2003. He was 82 (can you believe that??) and hadn't appeared on the operatic stage since 1976. Corelli had his share of frenzied admirers in the 1960s. Fan clubs sprang up around this moodily handsome tenor with a powerful voice of burnished gold. A live performance with Corelli meant excitement both onstage and in the audience. Even so, this was a good decade for tenors, the critics rightly pointed to Carlo Bergonzi and Nicolai Gedda, for example, as more faithful and self-effacing exponents of this repertoire. Even Corelli's biggest detractors, however, were hard-pressed to deny that the tenor was possessed of a glorious and macho instrument which he was not at all shy (in spite of his supposed nervousness) of showing off. Nine of the arias here were recorded in 1967 with Ferraris and the New Philharmonia Orchestra. I don't understand why they haven't been released until now, as they find the tenor in top form. (Apparently at the time Corelli thought that more work was needed before they could be released. Nevertheless, he approved the release of the present CD.) Of course one has to take the good with the bad. Corelli was a "sobber," and many of his phrases are broken or studded with unnecessary (but very emotional!) aspirates. He scoops, and not much can induce him to sing softer than forte. His French diction is particularly bad, but even his Italian is marred by a tendency to lisp sibilants. And weirdly, "Che gelida manina" actually begins at "In poverta mia lieta"; apparently Corelli was going to re-record the aria's beginning at some point and never got around to it. But what a voice! It is like the noble bellowing of the world's most beautiful wild animal. I will mention here that the infrequently recorded aria from Catalani's Loreley, "Nel verde maggio," is gorgeous, and well worth hearing any decent tenor sing. The Ballo and Trovatore arias were taped in 1964 to an orchestral accompaniment recorded back in 1958 for an aborted LP by rival tenor Daniele Barioni. Again, Corelli's vocalism is certainly up to snuff, although "Di quella pira" is so abbreviated (and rushed) as to be almost senseless. Corelli did not make commercial recordings of most of these roles, so this recital is of obvious value. And come on, it's Corelli! The engineering still sounds good, although the 1964 vintage high notes are "peaky." Texts and translations are included – how about that? 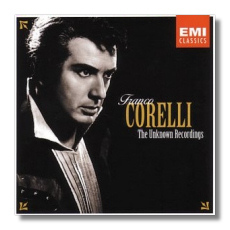 Given his singing, it hardly seems appropriate to request a moment of silence for Franco Corelli. Let's just play the hell out of this CD instead.